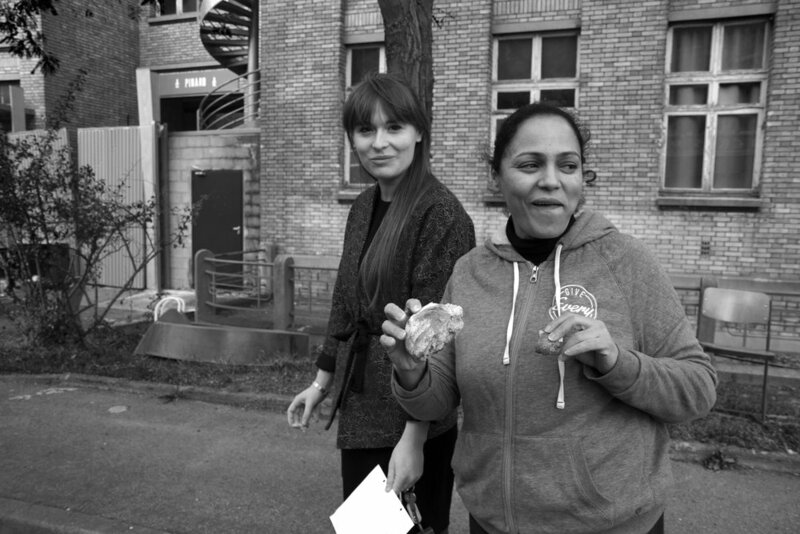 Jacqueline is one of the 400 people sheltered by Aurore. Before interviewing her, I met her once on a press tour of the Neighbours, where coordinators of each project on site were invited to share experiences and their story and show people around. At the end of the tour I went to see her: I asked her for a phone number, took her a photo, and asked whether I could interview her in the kitchen while she was cooking. After two weeks I received a message. She agreed. She came with another woman, they were both carrying a few crates of vegetables and basic goods. The other woman is called Nadia, Jacqueline’s niece. Where are all these vegetables from? La Récupération alimentaire is a food recovery service that links donors from the restaurant sector, event organisers, caterers, and community associations with markets who redistribute food in order to fight against food waste by facilitating and organising the redistribution of products that are still in good condition, but would be thrown in the dumpsters. In France, more than 7 million tons of food waste are thrown out at different points along the food chain. The whole idea is actually a food surplus kitchen. Food banks, and other charities have engaged more actively in recent times. In 2016 France became the first country in the world to ban supermarkets from throwing away or destroying unsold food, forcing them instead to donate it to charities and food banks. In 2016 a law was introduced which obliged markets to donate their surplus produce to associations. 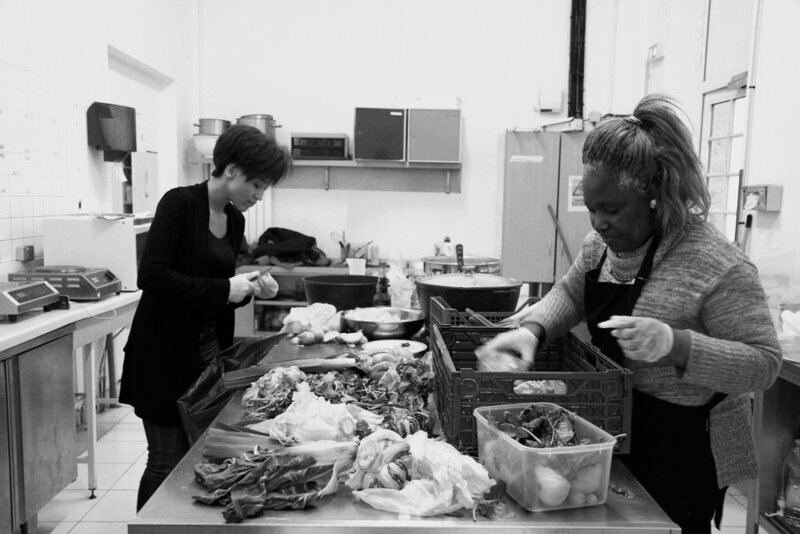 Jacqueline founded one such association, “Cite de Platon”, which is a sort of a food bank. She has a deal with Bio C’Bon (one of the main organic supermarket chains in France) for fruit, vegetables and other products. Partnerships like this are a logical and important step in the battle to combat food waste in Europe and other developed countries, where the hypermarket tradition brings with it record food excesses. How did you decide to come to France? "I come from Douala, Cameroon, where I was the president of an associative project for women public management. My husband was also a manager at a public administration, so he had contacts. At that time, there was an exchange programme with the Ministry of Foreign Affairs in France, focusing on women with high profiles from sub-Saharan African countries. The programme gave me the opportunity to get a scholarship and come to study in France, to get involved in public associations and NGOs, and learn how to contribute to other women’s empowerment. I came to study public administration at l’ENA (the National School of Administration). The initial idea was that, once I’d graduated, I’d go back to my country, and get involved in the government, build a women’s network, and teach them how to manage projects." So, why did you choose to stay? "I had health problems. I was hospitalized, and had to undergo a treatment which lasted for 4 years. It was a medical experiment. The doctor had to closely monitor my reactions to the medications I was prescribed: they are all new, not really tested before. There were many side effects, some days I couldn’t even walk. A few months ago I stopped the treatment. It’s been 4 years now since I started taking the medication upon prescription, and underwent surgery, but I still need to stay in France due to the better quality of the healthcare services." How did you get involved with the Food Project? "I was working recently as an administrative assistant at the National Sports Institute (INSEP), and then in 2013 I couldn’t continue. I came to live here - it was part of the Aurore association, which was the only association here in 2013. After graduation, I wanted to get involved in a project here, with the general chefs, and managers of the restaurant. Yes We Camp were thinking they wanted to start a Food project, do research, find sponsors, and associations to work with, and make it inclusive for the residents. So I decided to do this. At first, there was nothing in the kitchen; everything you see now, we bought it step by step, the residents, and the volunteers behind the initiative." The project has run for two years? "Less. It officially started in 2016, but there was a lot to be done before: in 2015 we were already doing a lot." You were cooking for events, for the bars and restaurants at Les Grands Voisins, did you have a fixed percentage of what you sell? "Yes, we were doing many different things. And no, normally we were taking between 15-20EUR, depending on the time, whether it was lunch time, or evenings, when there are more people, during the week or on weekends when you have more people." Les Grands Voisins is closing its doors on December 22, and then what happens? "As you mentioned, I am one of the more privileged residents. I have education at least, but what happens to the other people, who are not integrated, I can’t say. I am sure they will come up with something; it will be a slow transition. I hope they find another place. I will continue with my association, Cite de Platon. It started thanks to Les Grands Voisins - if it wasn’t for the FOOD project, I would never have thought of starting a project like Cite It’s about connecting with different ideas, and this is something I want to do. I will also continue cooking, and learn more. It won’t be easy, but for me this has been an opportunity to start something on my own. To feel important in a way, and meet so many people, I am sure many others felt the same." NIYA SHEKEROVA is a visual storyteller and a coffee addict based in Paris. She loves exploring the city's outdoors with her camera. And in the wide open air - green apples, country roads, mountain walks, midnight talks and olives! Her Instagram is also absolutely amazing.